GTM Research and SRECTrade publish SREC Market Monitor: Q4 2012, the industry's leading source for strategic data and analysis on SREC market strategies in seven states. Click here for more details. 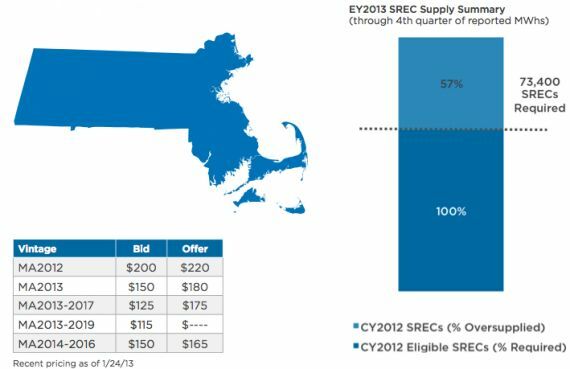 SRECTrade expects solar renewable energy credit (SREC) oversupply in 2012 to continue throughout the 2013 compliance year in Massachusetts. The formula used to adjust the requirement each year is intended to compensate for such an instance of consecutive oversupplied years; however, as currently written, the law would not have the desired affect. Due to the significant SREC shortage in 2011, the formula reduces the requirement for 2013, which would likely lead to a third consecutive year of SREC oversupply in 2014. However, the state's Department of Energy Resources (DOER) intends to adjust the formula so that the alternative compliance payments (ACPs) paid in 2011 don't reduce the requirement in 2013, 2014 and beyond. The impact of this change could bring the 2014 market closer to equilibrium. 1 SREC requirement adjusted for exempt load estimates under TransCanada settlement. Estimated megawatt (MW) capacity needed to be running all year long on average if only current vintage SRECs are used in current reporting year. 2013 SREC Requirements currently under evaluation by the DOER to increase due to an adjustment in the formula used to calculate MA’s Solar RPS requirements. As the 2012 trading period closes out over the next six months, we will learn a lot about how the program will operate over the next few years. 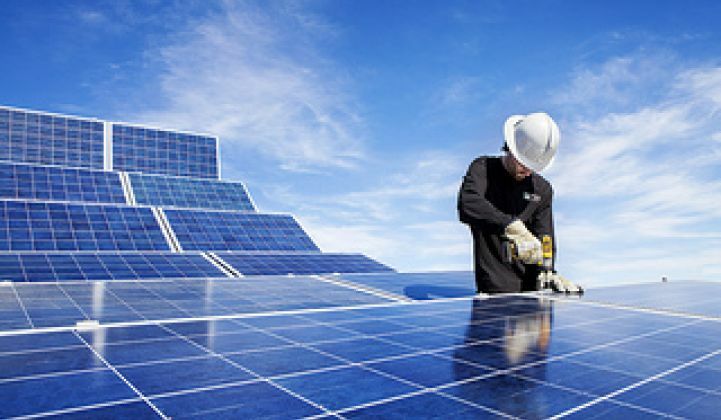 First, though it is unclear whether the Solar Credit Clearinghouse Auction will conclude successfully, the existence of this option does provide a level of price support in the market that does not exist in other states. Since the 2012 compliance year is a buyer's market, sellers must consider two factors when selling SRECs. Firstly, they will need to consider the time value of money (that is, selling today versus holding out for the support mechanism), and second, they will need to assess the perceived risk involved with the support mechanism. So far in 2012, prices have dropped briefly into the high $100s, but have leveled off at around the low $200s. As long as the Solar Credit Clearinghouse Auction is a viable option, the market will determine a floor for trading during the year. The market could be expected to react similarly from one oversupplied year to the next. Finally, the result of the Solar Credit Clearinghouse Auction in July will tell us a lot about what to expect from the program moving forward. In all scenarios presented, 2013 will be oversupplied, by volumes likely greater than in 2012. Given the outlook for 2013, pricing in the forward market with delivery beginning in 2013 will continue to be below $200 per SREC. Developers focused on getting projects in the ground may start to accept lower-priced forward contracts in order to secure financing and meet required returns. This could lead to more speculative participation in forward contracts for future delivery, especially if the DOER auction clears.